Senior road users are invited to attend an event hosted by the St Helens Council Road Safety Team. The event will be held on WEDNESDAY 27th SEPTEMBER 2017 (10am-2pm) at Crownway Community Centre. There will be a number of multi-agency presentations during the morning session followed by a FREE hot pot lunch, with refreshments. The event will also feature a small market place of information and advice stands designed to raise awareness to drivers, pedestrians, cyclists and public transport users. The market place will have lots of information and freebies from all the agencies attending listed, specifically for senior road users. Eg. keyring, torches, pens, notepads, magnifying credit cards, etc.. 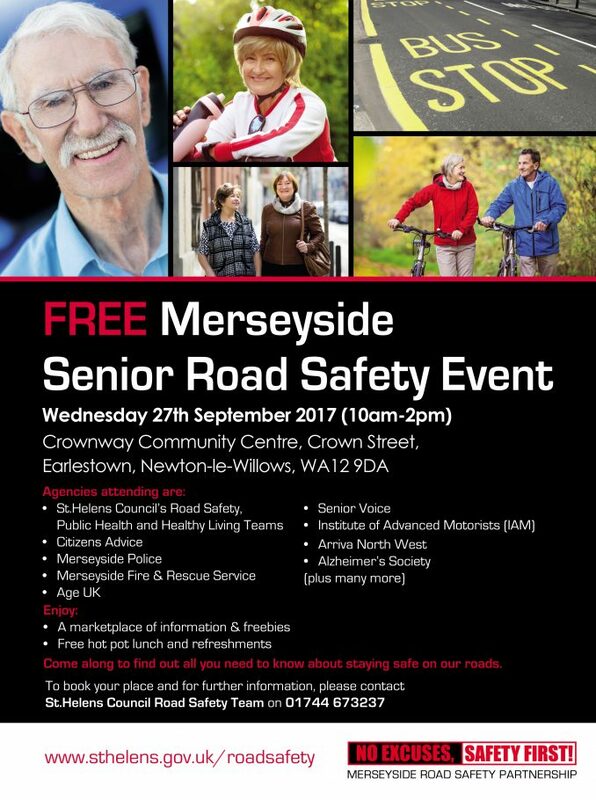 The agencies attending are from Merseyside Police, Merseyside Fire & Rescue Service, Arriva, Age UK, Senior Voice, Institute of Advanced Motorists, possibly Specsavers, St Helens Councils Road Safety Team and St Helens Head of Traffic & Engineering – George Houghton will be there. If you would like to attend, please contact Craig Fryer or Carol Bostock on 01925 222907 to book your place. Please note, places are limited so book as soon as you can.